This article is about the East Slavic ethnic group, regardless of country of citizenship. For all citizens of Russia, regardless of ethnicity, see Citizenship of Russia and Demographics of Russia. For other uses, see Russian (disambiguation). Russians (Russian: русские, tr. russkiye) are a nation and an East Slavic ethnic group native to European Russia in Eastern Europe. Outside Russia, notable minorities exist in other former Soviet states such as Belarus, Kazakhstan, Moldova, Ukraine and the Baltic states. A large Russian diaspora also exists all over the world, with notable numbers in the United States, Germany, Brazil, and Canada. 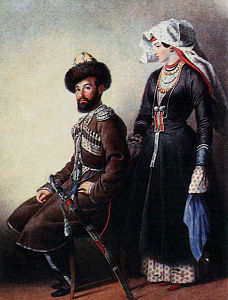 The Russians share many cultural traits with other East Slavic ethnic groups, specifically Belarusians and Ukrainians. They are predominantly Orthodox Christians by religion. The Russian language is official in Russia, Belarus, Kazakhstan, Kyrgyzstan, and Tajikistan, and also spoken as a secondary language in many former Soviet states. There are two Russian words which are commonly translated into English as "Russians". One is "русский" (russkiy), which most often means "ethnic Russians" (the subject of this article). Another is "россияне" (rossiyane), which means "citizens of Russia". The former word refers to ethnic Russians, regardless of what country they live in and irrespective of whether or not they hold Russian citizenship. Under certain circumstances this term may or may not extend to denote members of other Russian-speaking ethnic groups from Russia, or from the former Soviet Union. The latter word refers to all people holding citizenship of Russia, regardless of their ethnicity, and does not include ethnic Russians living outside Russia. Translations into other languages often do not distinguish these two groups. The name of the Russians derives from the Rus' people (supposedly Varangians). According to the most prevalent theory, the name Rus', like the Finnish name for Sweden (Ruotsi), is derived from an Old Norse term for "the men who row" (rods-) as rowing was the main method of navigating the rivers of Eastern Europe, and that it could be linked to the Swedish coastal area of Roslagen (Rus-law) or Roden, as it was known in earlier times. The name Rus' would then have the same origin as the Finnish and Estonian names for Sweden: Ruotsi and Rootsi. According to other theories the name Rus' is derived from Proto-Slavic *roud-s-ь ( from *rъd-/*roud-/*rуd- root), connected with red color (of hair) or from Indo-Iranian (ruxs/roxs — «light-colored», «bright»). 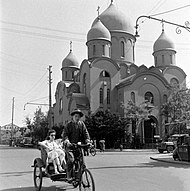 Until the 1917 revolution, Russian authorities never specifically called them "Russians", calling them "Great Russians" instead, a part of "Russians" (all the East Slavs). The modern Russians formed from two groups of East Slavic tribes: Northern and Southern. The tribes involved included the Krivichs, Ilmen Slavs, Radimichs, Vyatiches and Severians. Genetic studies show that modern Russians do not differ significantly from Belarusians and Ukrainians. Some ethnographers, like Dmitry Konstantinovich Zelenin, affirm that Russians are more similar to Belarusians and to Ukrainians than southern Russians are to northern Russians. Russians in northern European Russia share moderate genetic similarities with Uralic peoples, who lived in modern north-central European Russia and were partly assimilated by the Slavs as the Slavs migrated northeastwards. Such Uralic peoples included the Merya and the Muromians. The territory of Russia has been inhabited since 2nd Millennium BCE by Indo-European, Ural-Altaic, and various other peoples; however, not much is known about them. Outside archaeological remains, little is known about the predecessors to Russians in general prior to 859 AD when the Primary Chronicle starts its records. It is thought[by whom?] that by 600 AD, the Slavs had split linguistically into southern, western, and eastern branches. The eastern branch settled between the Southern Bug and the Dnieper Rivers in present-day Ukraine; from the 1st century AD through almost the turn of the millennium, they spread peacefully northward to the Baltic region, forming the Dregovich, Radimich and Vyatich Slavic tribes on the Baltic substratum, and therefore experiencing changed language features such as vowel reduction. Later, both Belarusians and South Russians formed on this ethnic linguistic ground. Kievan Rus' was a loose federation of states that existed from the late 9th to the mid-13th century. Modern Russians derive their name and cultural ancestry from Kievan Rus'. After the Dissolution of the Soviet Union an estimated 25 million Russians began living outside of the Russian Federation, most of them in the former Soviet Republics. Today the largest ethnic Russian diasporas outside Russia live in former Soviet states such as Ukraine (about 8 million), Kazakhstan (about 3.8 million), Belarus (about 785,000), Latvia (about 520,000) with the most Russian settlement out of the Baltic States which includes Lithuania and Estonia, Uzbekistan (about 650,000) and Kyrgyzstan (about 419,000). There are also small Russian communities in the Balkans, including Lipovans in the Danube delta, Central European nations such as Germany and Poland, as well Russians settled in China, Japan, South Korea, Mexico, Brazil, Argentina and Australia. These communities may identify themselves either as Russians or citizens of these countries, or both, to varying degrees. Significant numbers of Russians emigrated to Canada, Australia and the United States. Brighton Beach, Brooklyn and South Beach, Staten Island in New York City is an example of a large community of recent Russian and Russian Jewish immigrants. Other examples are Sunny Isles Beach, a northern suburb of Miami, and in West Hollywood of the Los Angeles area. See also: Category:Russian folk culture. Vasilisa the Beautiful, by Ivan Bilibin. Russian fairy tale collected by Alexander Afanasyev in Narodnye russkie skazki. Russian literature is known for such notable writers as Aleksandr Pushkin, Leo Tolstoy, Fyodor Dostoevsky, Anton Chekhov, Vladimir Mayakovsky, Boris Pasternak, Anna Akhmatova, Joseph Brodsky, Maxim Gorky, Vladimir Nabokov, Mikhail Sholokhov, Mikhail Bulgakov, Andrei Platonov, Aleksandr Solzhenitsyn, and Varlam Shalamov. Russians also gave the classical music world some very famous composers, including Piotr Ilyich Tchaikovsky and his contemporaries, the Mighty Handful, including Modest Mussorgsky and Nikolai Rimsky-Korsakov. In the 20th-century Russian music was credited with such influential composers as Dmitri Shostakovich, Sergei Prokofiev, Sergei Rachmaninoff, Igor Stravinski, Georgy Sviridov. As of a different sociological surveys on religious adherence, from 41% to over 80% of the total population of Russia adhere to the Russian Orthodox Church. It has played a vital role in the development of Russian national identity. 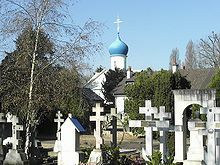 In other countries Russian faithful usually belong to the local Orthodox congregations which either have a direct connection (like the Ukrainian Orthodox Church, autonomous from the Moscow Patriarchate) or historical origin (like the Orthodox Church in America or a Russian Orthodox Church Outside of Russia) with the Russian Orthodox Church. Russians have greatly contributed to the fields of sports, science and technology, politics, business, and the arts. In science and technology, notable Russian scientists include Dmitri Mendeleev, Nikolay Bogolyubov, Konstantin Tsiolkovsky (a founding father of rocketry and astronautics), Andrei Kolmogorov, Ivan Pavlov, Nikolai Semyonov, Dmitri Ivanenko, Alexander Lodygin, Alexander Popov (one of inventors of radio), Nikolai Zhukovsky, Alexander Prokhorov and Nikolay Basov (co-inventors of laser), Vladimir Zworykin, Lev Pontryagin, Sergei Sobolev, Pavel Yablochkov, Aleksandr Butlerov, Andrei Sakharov, Dmitry Ivanovsky, Sergey Korolyov and Mstislav Keldysh (creators of the Soviet space program), Aleksandr Lyapunov, Mikhail Dolivo-Dobrovolsky, Andrei Tupolev, Yuri Denisyuk (the first practicable method of holography), Mikhail Lomonosov, Vladimir Vernadsky, Pyotr Kapitsa, Igor Sikorsky, Ludvig Faddeev, Konstantin Novoselov, Fyodor Shcherbatskoy, Mikhail Kalashnikov (inventor and designer of the AK-47 assault rifle and PK machine gun), and Nikolai Trubetzkoy. Russian Literature representatives like Leo Tolstoy, Fyodor Dostoevsky, Ivan Turgenev, Anton Chekhov, Alexander Pushkin, and many more, reached a high status in world literature. Prominent Russian novelists such as Tolstoy in particular, were important figures and have remained internationally renowned. Some scholars have described one or the other as the greatest novelist ever. Russian composers who reached a high status in the world of music include Igor Stravinsky, Pyotr Ilyich Tchaikovsky, Dmitri Shostakovich, Nikolai Rimsky-Korsakov, Sergei Prokofiev, Modest Mussorgsky, and Sergei Rachmaninoff. Russian people played a crucial role in the victory over Nazi Germany in World War II. According to the British historian Richard Overy, the Eastern Front included more combat than all the other European fronts combined—the Wehrmacht suffered 80% to 93% of all of its total World War II combat casualties on the Eastern Front. Russia's casualties in this war were the highest of all nations, and numbered more than 20 million dead (Russians composed 80% of the 26.6 million people lost by the USSR), which is about half of all World War II casualties and the vast majority of Allied casualties. ^ "журнал "Демоскоп Weekly" № 571 - 572 14 - 31 октября 2013. А. Арефьев. Тема номера: сжимающееся русскоязычие. Демографические изменения - не на пользу русскому языку". ^ "Численность населения Республики Казахстан по отдельным этносам на начало 2016 года". stat.gov.kz. ^ "Regarding Upcoming Conference on Status of Russian Language Abroad". Russian Ministry of Foreign Affairs. Retrieved 24 June 2014. ^ Of these, only 122 thousand ethnic Russians are the rest - Volga Germans, Jews and Baltic nationalities. ^ "American FactFinder - Results". Data Access and Dissemination Systems (DADS). ^ "Moldovan Population Census from 2004". Moldovan National Bureau of Statistics. Archived from the original on 14 November 2010. ^ "2004 Census data for Transnistria: PMR urban, multilingual, multicultural". pridnestrovie.net. Archived from the original on 17 February 2007. ^ "La communauté russe en France est "éclectique"". ^ Maria Stella Ferreira Levy. O papel da migração internacional na evolução da população brasileira (1872 to 1972). inRevista de Saúde Pública, volume supl, June 1974. 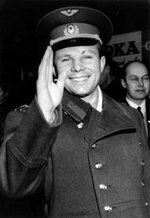 ^ "Gyventojų pagal tautybę dalis, palyginti su bendru nuolatinių gyventojų skaičiumi". osp.stat.gov.lt. Retrieved 13 August 2017. ^ "The State Statistical Committee of the Republic of Azerbaijan". azstat.org. Archived from the original on 7 January 2012. ^ "Population structure". Statistics Finland. 1 April 2016. Retrieved 13 October 2016. ^ "Australian Bureau of Statistics". Abs.gov.au. Retrieved 22 July 2012. ^ "МИД России | 12/02/2009 | Интервью Посла России в Турции В.Е.Ивановского, опубликованное в журнале "Консул" № 4 /19/, декабрь 2009 года". Mid.ru. Retrieved 22 July 2012. ^ "(number of foreigners in the Czech Republic)" (PDF) (in Czech). 31 December 2016. Retrieved 6 October 2017. ^ "출입국·외국인정책 통계월보". 출입국·외국인정책 본부 이민정보과. ^ The source is not Russian but Russian Koreans. ^ "Utrikes födda efter födelseland, kön och år". www.scb.se. Statistiska Centralbyrån. Retrieved 25 May 2017. ^ "(2000 census)". Stats.gov.cn. Retrieved 22 July 2012. ^ "(2002 census)". Nsi.bg. Retrieved 22 July 2012. ^ "(2002 census)" (PDF). Retrieved 22 July 2012. ^ "Census ethnic group profiles: Russian". Stats NZ. 2013. ^ "Country - Venezuela :: Joshua Project Joshua Project". Joshua Project. ^ "Census of Population, Households and Dwellings in Montenegro 2011" (PDF). Statistical Office of Montenegro. 12 July 2011. Retrieved 13 October 2016. ^ a b "Two sources of the Russian patrilineal heritage in their Eurasian context". American Journal of Human Genetics. 82 (1): 236–50. January 2008. doi:10.1016/j.ajhg.2007.09.019. PMC 2253976. PMID 18179905. ^ Pravoslavie.ru. Retrieved 10 February 2016. ^ Blöndal, Sigfús (16 April 2007). The Varangians of Byzantium. Cambridge University Press. p. 1. ISBN 9780521035521. Retrieved 2 February 2014. ^ Максимович К.А. (2006). "Происхождение этнонима Русь в свете исторической лингвистики и древнейших письменных источников". КАNIEKION. Юбилейный сборник в честь 60-летия профессора Игоря Сергеевича Чичурова. М.: ПЕТГУ: сс.14–56. ^ a b "Новости NEWSru.com :: Ученые завершили масштабное исследование генофонда русского народа (Фотороботы)". Newsru.com. Retrieved 22 July 2012. ^ Мурома, мещера [Murom, Meschera]. emc.komi.com (in Russian). Archived from the original on 23 May 2008. ^ "Russia - History". Encyclopedia Britannica. Retrieved 28 August 2018. ^ Russians left behind in Central Asia. BBC News. November 23, 2005. ^ "Saving the souls of Russia's exiled Lipovans". The Daily Telegraph. April 9, 2013. ^ Bigg, Claire (15 August 2006). "Latvia: Ethnic Russians Divided On Moscow's Repatriation Scheme". Rferl.org. Retrieved 22 July 2012. ^ "The Ghosts of Russia That Haunt Shanghai". The New York Times. 21 September 1999. ^ "Russia". Encyclopædia Britannica. Retrieved 31 January 2008. ^ Microsoft Encarta Online Encyclopedia 2007. Russian Literature. Archived from the original on 20 August 2009. Retrieved 7 January 2008. ^ "Russia::Music". Encyclopædia Britannica. Retrieved 5 October 2009. ^ "A Tale of Two Operas". Petersburg City. Retrieved 11 January 2008. ^ Garafola, L (1989). Diaghilev's Ballets Russes. Oxford University Press. p. 576. ISBN 0-19-505701-5. ^ "Russia::Motion pictures". Encyclopædia Britannica. 2007. Retrieved 27 December 2007. ^ Olga Filina (Ogonek Magazine). Mapping Russia's Religious Landscape. Russia and India Report. Retrieved 24-09-2012. ^ Верю — не верю. "Ogonek", № 34 (5243), 27/08/2012. Retrieved 24-09-2012. ^ Опубликована подробная сравнительная статистика религиозности в России и Польше (in Russian). ^ "Русская линия / Библиотека периодической печати / Как пишутся страшные сказки о Церкви". Rusk.ru. 31 August 2005. Retrieved 14 May 2011. ^ "statistics". Adherents.com. Retrieved 22 July 2012. ^ Victor Shnirelman. "Christians! Go home": A Revival of Neo-Paganism between the Baltic Sea and Transcaucasia. Journal of Contemporary Religion, Vol. 17, No. 2, 2002. ^ "Russian literature." Encyclopædia Britannica. 2007. Encyclopædia Britannica Online. 16 July 2007 <>.